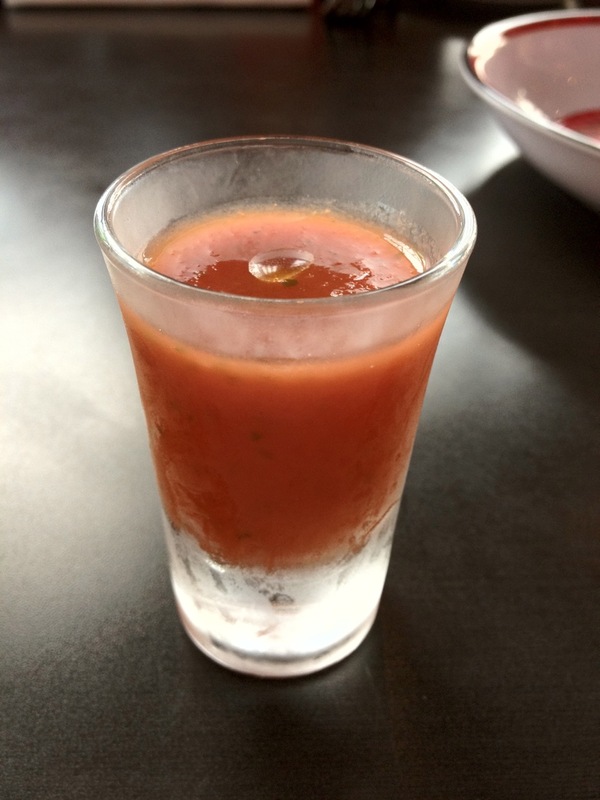 The dinner started with a complimentary shooter of a tomato puree with dash of tabasco, herbs and chilled to a cooling temperature. 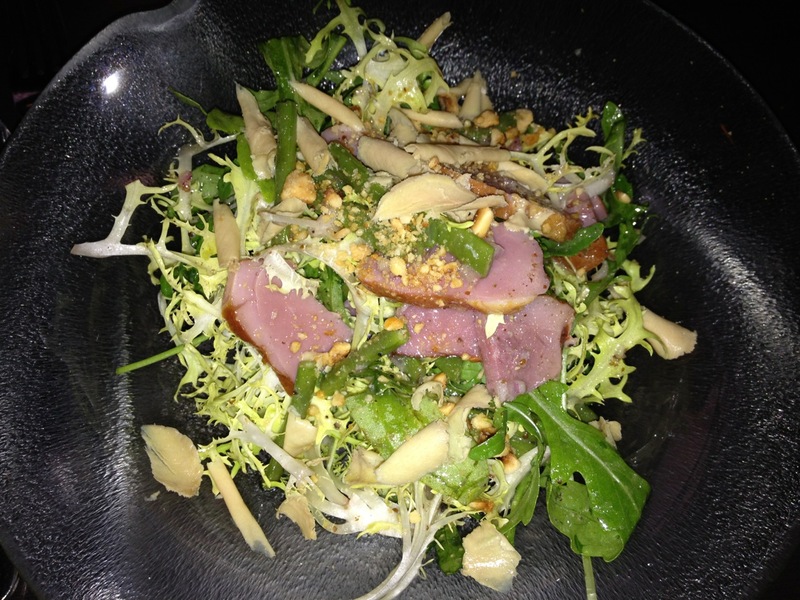 The first of the two starters from the set menu is a salad with smoked duck with a oriental sauce. The texture is like a typical Thai salad (with crunchy nuts, shallots and beans) but the dressing is definitely western vinaigrette-type dressing. I don’t think the 2 combination work, but my wife like these types of east-meet-west salads. The Lobster Bisque (the other Starter choice in the set menu) was presented in a teapot and was watery with too much sherry – a disappointment. 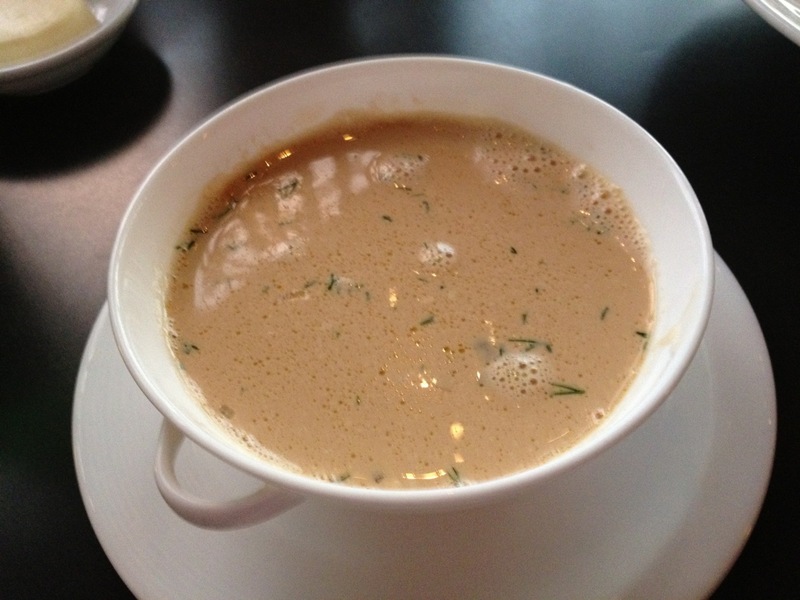 However, in the other a la carte starter which feature an espresso shot of the same bisque, the crustacean flavour was more powerful and the bisque was more balanced. Weird. The ambiance of the place was meant for quiet dates and tote-a-tete with your love ones. So when the night falls, the lighting in the place was so dim, you don’t really see the colour of the food presentation. 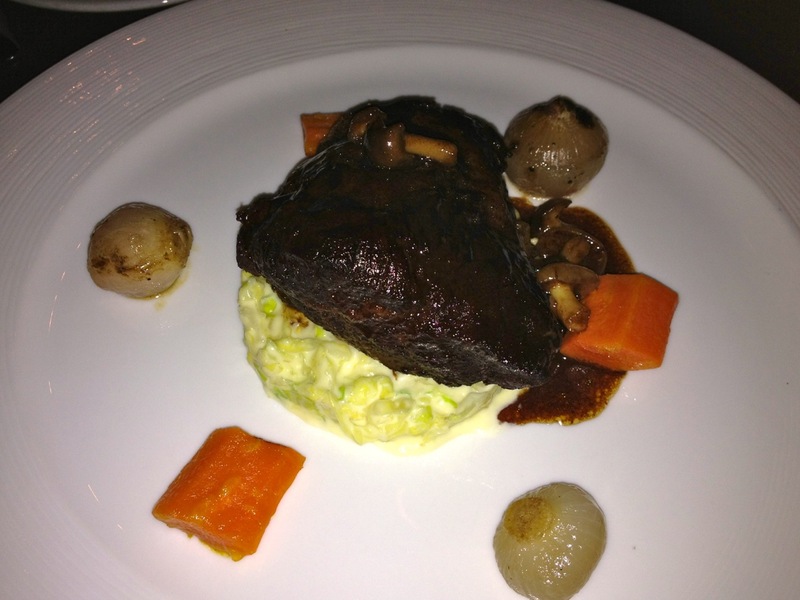 Which was no lose, because the piece of beef shoulder was of an unappetizing colour, it was better left in the dark. The saving grace of this dish? The creamed cabbage and mashed potato that the meat was seated on. There is a little story that happened for this dish. Jo had the fish, but did not finished it after the first bite. However the bed of salad was ravished. The waiter clearing the plate asked if she was done, and noticed that the fish was untouched and asked why. She said “Too dry”. Next the manager came, and asked if she wanted the dish redone, which we politely declined as we were quite full. Anyway, the manager insisted, and out came another portion. Now, the comment for the second Salmon (the first one was “Too dry”) – excellent! 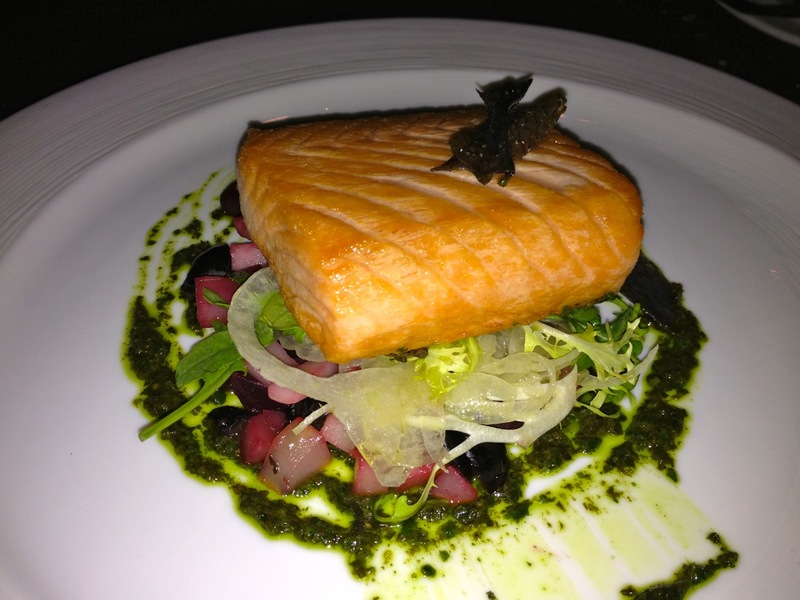 So if you asked for this dish at Equinox, asked for the fish to be slightly pink inside. The crust was crispy and well seasoned. The salad was fantastic at both time. 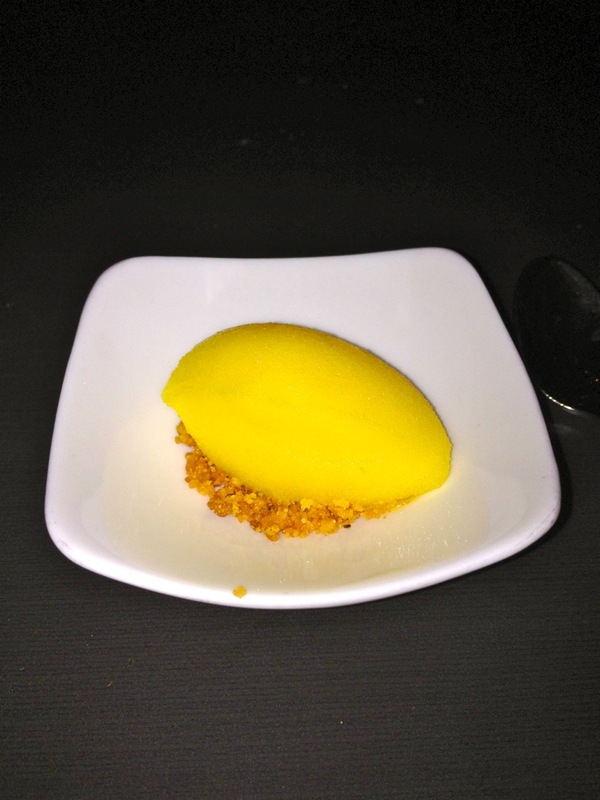 A sorbet was presented to cleanse our palate before the dessert. Hmm, shouldn’t this came between the starter and the main? 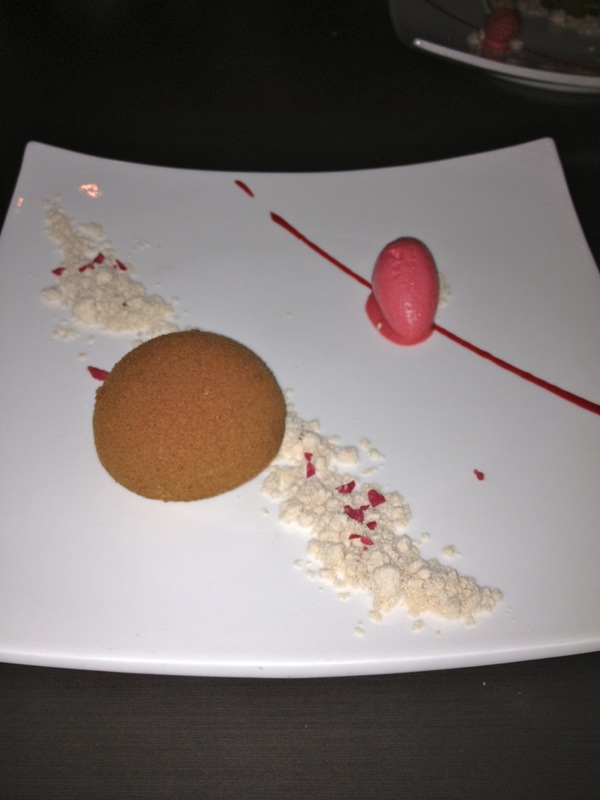 Well, well, not exactly what the menu mentioned, it was a strawberry ice cream, chocolate mousse parfait and a sweet white substance. A sweet ending, but nothing great. All in all, a good evening, excellent ambiance, food that are good but not great, but excellent service. Perfect venue for a date, a business dinner (?) and for first time visitors of Singapore who want a view of the Marina Bay Financial District and a meal to accompany it.